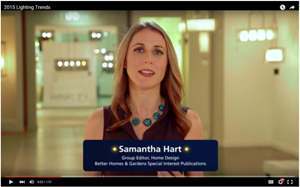 See the latest home lighting trends in this new video from ALA and Better Homes & Gardens. Almost any room can be transformed into a picturesque space by lighting it based on its aesthetic features and blind spots. The best way to diminish shadows, accentuate textures, and draw attention to just the right areas is to use a lighting technique called layering. With the increased availability and fixture styles for LED lighting, which is deemed safer, sturdier, and more durable than CFL light bulbs by the Department of Energy, it is quickly becoming a go-to lighting source for all areas of the home. That also means LEDs are an efficient and effective light source for layering. Layered lighting focuses on three main functions: general, accent and task lighting. A wide wash of light is usually exerted by a ceiling light for general illumination. A decorative layer of light might come from sconces or a table lamp. For specific tasks, pendants or undercabinet lighting are a few examples of appropriate lighting. Visit ALA online for more about how to beautifully light your home. A constant in any residential lighting project is making sure it results in an area in which you will actually want to spend your time. To guarantee that you enjoy a room, the lighting should be easy to navigate and easy on the eyes. This is usually the job of ambient (general) lighting. To complement all-purpose lighting, LED lights have traditionally been used in the subsequent layers of accent and task lighting. It is with accent lighting, that LED lights may be the most useful. For example, track lighting is often used for accent lighting so the lighted area can be easily adjusted in size, color or direction. Some new types of LED track lighting can be adjusted by hand to change the color or size of the light beam, and there are even fixture types with built-in adjusting systems that can be operated by remote control or a cell phone app. We are remodeling our bathroom. What suggestions or advice do you have regarding the use of LED can lights in a bathroom? -Debra B. Adding LED can lights is a very good idea. Be sure to select LED fixtures with a warm color. LEDs are available in a variety of color temperature options: 2700K, 3000K, 3500K and 4000K. To get the same warm color as incandescent lighting, choose 2700K. You may need to replace your dimmers with a type that can dim your LEDs. If you are purchasing new LED can lights manufactured by an ALA member, they will be able to recommend the best dimmer to optimize your lights.